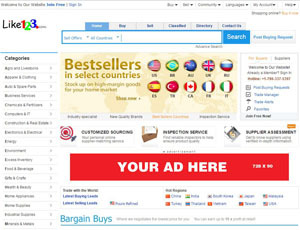 Like123.com is an International marketplace that offers b2b directory of suppliers, exporters, importers, buyers, reseller, wholesalers, manufacturers, products and trade leads from our global trade site. Like123.com established in 2001 and has grown-up to a mature and professional B2B Portal that addresses the needs of business of more than 27 Industries in over 200 Countries with an aim to provide a complete solution where the companies meet online to do business. Like123.com's mission is to help small-and-medium-sized enterprises compete in international trade, advance into new markets and meet the needs of their clients. The B2B website allows users to post and browse company information and trade related information in 27 categories and over 1200 sub-categories. We are proudly served thousands of clients all over the world to make unmatched contribution for industrial competitiveness worldwide. About Like123.com - B2B trade leads directory for Importers and Exporters's recommend,only on behalf of the views and opinions about B2B Directory, if you have any suggestions , please feel free to contact with us, we will amend and correct them in the first time according your suggestions. More better B2B Websites recomend, Please click here.